Black Hills Gold rings by the world's premiere manufacturer - Landstrom's Original Black Hills Gold Creations®. Gold Mountain Trading is your one stop shop for Black Hills gold rings! We provide you rings from Landstrom's Original Black Hill Gold Creations, one of the top manufacturers of Black Hills gold rings in the world. Bask in the meticulous craftsmanship of Landstrom's experts, and the aesthetic appeal of the intricate designs of these rings. 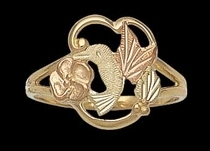 We provide Black Hills gold rings at 33% off!